let’s be basic and set some goals, shall we? (would love to know yours too, if you’re the goal making type of person). i went out way too much last quarter since i had a car and senioritis, meaning my eating habits weren’t the best (although i got back into the gym a few times every week, so at least there was some semblance of balance). i excused it away as, what if i never live here again?? so i’m trying to shift some of the restaurant trying to sightseeing, so that i get to explore, but hopefully in a more movement, less food way. last year i got a lot more comfortable using a dslr, but now i need to get used to a tripod. my parents have one that isn’t fun to work with, and overall it feels so much more restrictive rather than me being able to move and tilt whenever i need to. BUT, picture sharpness and all that (my hands shake, aka good thing i am not a surgeon). it would be very easy for me to coast through the rest of the school year (and college!!) in a flurry of concerts and restaurants and sight seeing (and i suppose studying and job searching too), but that’s so comfortable. i want to force myself to try other things that a little more scary while i still have this bubble of college and not-really-adulthood. same goes for what’s on the blog. cakes are much more fun than pies to me, which are stressful, but how am i supposed to be able baker (that’s my nickname in one of my facebook chats with some of my friends) if i can’t bake a pie consistently?! both in my professional and blogging lives. i’m in performance marketing, and it’s easy easier to be data driven if you know what to look for. but at my new internship (i’ll tell you about that soon! ), i don’t have the luxury of having a foundation, so i need to do it on my own. and on this blog, it’s been driven by what i want + the seasons. as in, oooh, chocolate mint sounds good, i’ll make something with that flavor combo, and oh, people like that during the winter holidays. rather than doing research for what has worked well for me in the past + what people are searching for + what is less competitive (ie there are obviously less recipes on the internet for shiitake dun dan than chocolate cake). which brings us to the asian steamed egg. it comes in many names: chawanmushi (japanese), dun dan (chinese), gyeranjjim (korean). there’s probably more, but those are the ones that i know of. and though it looks like dun dan would be pronounced as in you’re done, dan in a horribly stereotypical western accent, it’s more like dun dahn, with a long “ahh” sound. i could try to say chawanmushi and gyeranjjim, but it’s a crapshoot and much easier to say steamed egg when i’m in a situation where dun dan doesn’t suffice. they’re basically the same at the base level: egg mixed with water/broth, seasoned with whatever and maybe with meat or veggies added in as well. HOWEVER. chawanmushi and dun dan usually have a higher water to egg ratio than gyeranjjim, and gyeranjjim is less custardy than the others. the first time i made this was as a stressed teenager (i think i was more stressed/motivated in high school than in college), when given the ultimatum to either make dun dan for dinner or go to trader joe’s to get other ingredients for dinner. full disclosure: i love tj’s (sights of pickles, olives, macarons and other delicacies! samples!! ), but was too lazy to get out of the house that day. it’s a testament to how easy making dun dan is, and how tasty it is. it’s super silky and smooth, and gently eggy (this is kind of perfect if you’re serving someone who isn’t that into eggs). it feels ridiculously rich, even though it’s only eggs and water/broth. 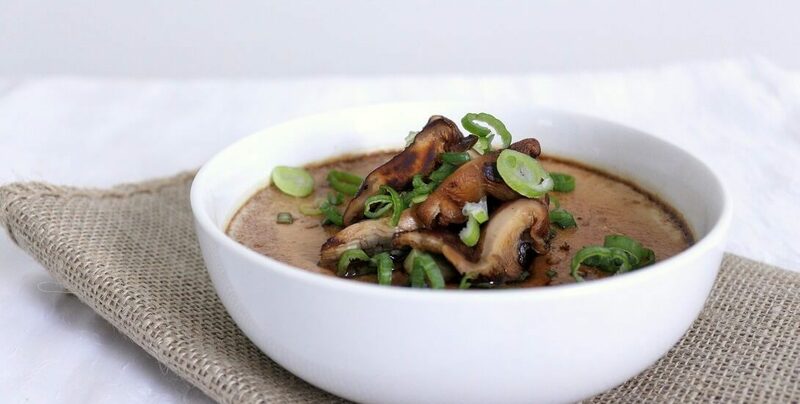 the bite of the green onions is perfect to balance out that decadence, and soy sauce + toasted sesame oil + shiitake mushrooms make sure that this shiitake dun dan is anything but bland. plus, it’s perfect with rice. so much so that i was trying to think of an alternative (quinoa or greens or something), but rice sops all the juices up and there’s just no comparison. 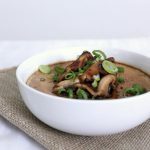 This shiitake dun dan features super fluffy steamed eggs topped with plenty of sauteed shiitake mushrooms for a meal that feels heartier than it looks. In a medium bowl, whisk eggs until completely homogeneous. Stir in the stock, sake/mirin and 1/2 tsp soy sauce. Place the mushrooms in a shallow, heat-proof bowl, then pour the eggs on top. Place a small metal rack in a saucepan, then add water until the legs of the rack are half submerged. Bring to a boil, then reduce the heat to a simmer. Place the bowl of eggs on top of the rack. Cover and steam for 10-12 minutes, or until the egg is firm but still soft and silky. A knife inserted into the center of the shiitake dun dan should come out cleanly, and the center should jiggle slightly but not slosh around (think creme brulee or Jello or panna cotta). When in doubt, decrease the temperature and/or check the dun dan frequently. Remove the dun dan from the pot carefully, then cool slightly. Drizzle 1 T soy sauce and the sesame oil on top. 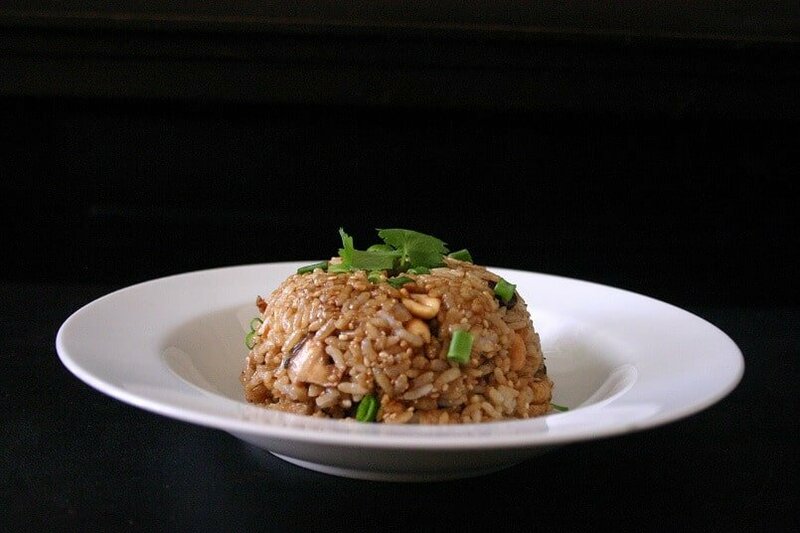 Garnish with scallions and serve hot with plenty of rice. Adapted slightly from CONNIEL1M via AllRecipes. You can mix it up and not do shiitake. Sauteed shrimp, browned ground beef, cooked chicken, sauteed onions, wilted greens, etc etc would be tasty here! In these pictures I used the shiitake mushrooms as a garnish, instead of cooking them into the dun dans. Either way works, but I'd recommend sauteeing them if you're planning to use the mushrooms as a topping. Sometimes simplicity in food is the best and this looks lovely and perfect for this cold snap we are currently in. Good luck with your goals for 2018, I’m not really a goal type person but like you I need to stop eating out so much as it’s not the healthiest option on the planet and enjoy more wholesome homemade food. that goal isn’t turning out that well for me, oops. i’ve been trying to balance it out with a lot more working out (i went to the gym 5 times last week), so that’s something?! Oh my this looks good. And it’s so warming! I’ve gained 20 pounds since starting my blog. But I won’t quit! I am motivated to buy a bigger, better, and stronger tripod, however. Thanks! ahhh yes blogging can be hard in that sense- i don’t know if i’d ever be able to be a baking blogger full time, because i have a feeling my overall health would plummet lol. Wow, this looks good! And seeems so comforting. I’ve never steamed an egg like that, I may just give this one a try. Maybe better than my usual veggie omelet! Thanks for the inspiration. And I like your list of goals! Good luck with them! not better/worse than an omelette, just different (: the eggy flavor is much more subtle in this, and it’s ridiculously fluffy. Shiitakes are my favorite mushroom and I love eggs so this is calling my name! Love the texture of that egg. A comforting bowl of healthy, delicious soup on this cold winter night (not that I’m complaining living in the bay area). I’m very basic, lol, so this is perfect for me. I had to pull back on eating out this year because I traveled a lot and it was truly worth it. I’ve also been using my tripod more often. I used to record all my videos on my computer and iPhone, I finally upgraded to a Big Boy Camera. I can’t wait to hear about your new internship. I’m going to try this recipe tomorrow, it looks delicious. i’m starting to plan a few trips too, so eating in more is probably called for (; and yay for upgrading to a big camera!! i bought one last summer, and the learning curve is still steep lol. Those are great goals. Don’t get comfy.. A BIG YES to that! I never had that steamed egg dish but I enjoy both mushroom and egg. And that bowl looks mighty yummy. Definitely saving it to try. Wow! The steamed egg look luscious! It’s so airy, silky, and smooth. I’d love to have some with now…definitely with a bowl of rice! Yum! super silky (: it’s pretty filling and cheap, hence why i try not to eat too much of it when i go to korean bbq (gotta get your money’s worth with the meat!!). Those are some awesome goals for sure! i need to steal your tripod idea i got them shaky hands too (and bad eyesight to boot) so when i look at the photo I think it is fine but when i upload it, it is blur city. 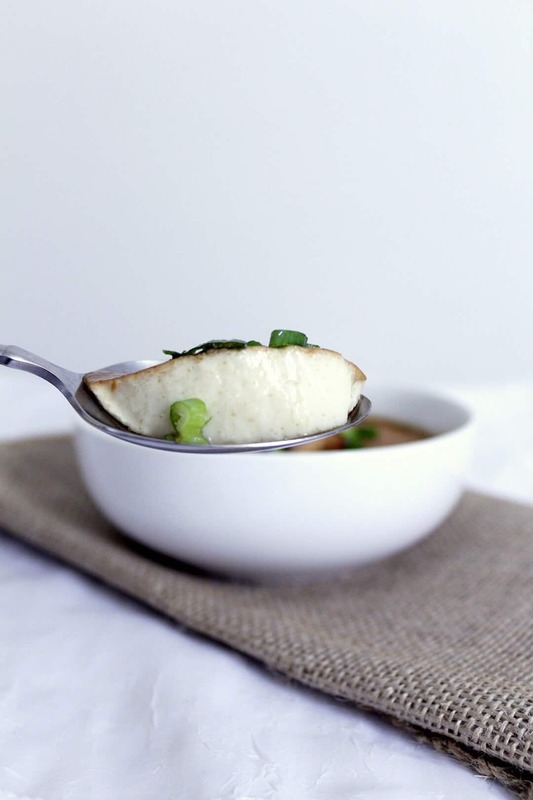 I love this steamed egg recipe. 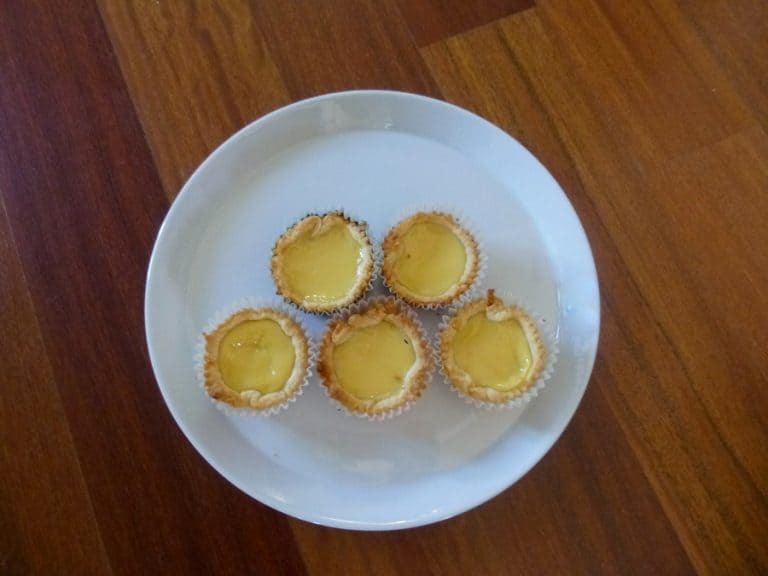 My mum used to make something similar whenever I was sick. This looks like gorgeous comfort in a bowl! This seems like an ultimate lunch recipe, Heather! Is there any alternative to using soy sauce? thanks! you can use tamari or liquid coconut aminos! or in a pinch, you could use salt. soy sauce is a little more complex than just a salty flavor, but salt could work. Oh my goodness this looks so good! Mushrooms are one of my very favorite foods! Love this! I’ve never had dun dan before, can’t wait to try this! These are great goals Heather. I often tell myself I need to stop being so comfy, haha I think I’ve gotten so “stuck” in Mom wear. I like the idea of trying new places, rather than restaurants too! Good luck with your goals for the year! I am totally with you about the tripod! My boyfriend suggested using an octopus one where it’s flexible and portable. I still haven’t used it yet XD. Sending you all of the positive vibes so you can power through the rest of your college career! Definitely looking forward to hearing more about your internship :)! The shiitake dun dan looks delicious! Love how it looks very sophisticated and easy to make! Girl, I am learning about all of the good recipes from you! aw thanks! i’m powering through the adventures and sleeping through the classes whoops. Good luck with your goals for 2018! I have very loose goals that revolve about taking care of myself more (especially mental health) and like you, not getting to comfy. I have a lot of blog growing goals too. A lot to tackle! Anyway, I love simple recipes like this; so comforting! Love all your goals! I’ve been tossing around a few goals, but I haven’t committed to any. I guess I should get on that! This dish sounds great! Love that it’s simple, and shiitake mushrooms are awesome! I love your goals Heather! I am drawing some inspiration from them and hoping that I stick to them! I wasn’t aware that something like dun dans existed! I like how the egg and broth are steamed together like this! Sounds so yummy! goals work for some people, and not for others (: i’m a very list oriented kind of person, so i like having goals lol. HAHAH dw i’ve definitely had my share of overdone dun dans (especially in the microwave- that’s so hard to control). mmm i’m craving some right now (especially bc i didn’t do much for lunar new year, and now all i want is chinese food).